The star of the show. 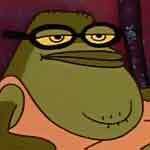 He works at the Krusty Krab restaurant. SpongeBob enjoys jellyfishing at Jellyfish Fields with his best friend Patrick the Starfish. He's always happy. 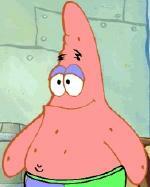 Patrick enjoys doing everything that Spongebob does. He is the dumbest creature under the sea. 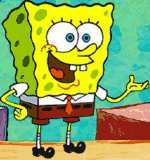 He is a great friend to SpongeBob. 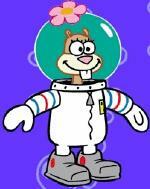 Since she's a land creature who need a pressurized suit to live under the water. She plays a lot of extreme sports. Both her and Spongebob love Karate. He is a boring squid who's main hobby is playing his clarinet but he's terrible at it. He also spends a lot of time making art. He thinks Spongebob and Patrick are very annoying because they constantly pester him. 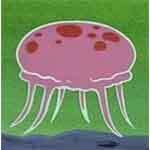 Gary is SpongeBob's pet sea snail who meows like a cat.. He may look dumb, but he might be smarter than the rest of Bikini Bottom. He keeps cool underpressure and has a solution for every problem. 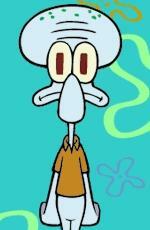 He is the employer of Spongebob and Squidward. 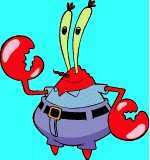 He is known for being extremely cheap but care alot about SpongeBob's welfare. He's only been in a few episodes, but he's mean, nasty, and an all-around hated character. 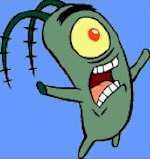 Nobody ever eats at the Chum Bucket Restaurant, so Plankton is trying to steal the Krabby Patty recipe from the Krabby Patty. 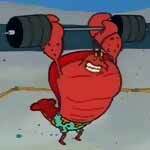 Larry's a strong muscular lobster who spends all his time at the beach. He's popular with the ladies and he's always lifting weights. Jellyfish roam around in groups making jelly and stinging anything that gets in thier way. There are different kinds of jellyfish including normal, queen, king, albino, and prehistoric. Jellyfishing is a sport enjoyed by SpongeBob and Patrick.